If you find that your iTunes library or other music libraries are in a mess caused by hundreds of duplicate songs that you purchased from music stores or got from other ways, you may need a duplicate remover to clean and sort your massive music library, which would be a time-consuming and an exhausting process if you did it manually. Therefore, the post will introduce you how to delete duplicate songs on iPhone/iTunes/iPad/iPod. To remove deuplicates for iPhone/iPad/iPod, you get 2 methods. The first one is to make use of iTunes, while the 2nd one is making use of 3rd-party duplicate remover tool. This guide explains both these 2 methods in details. You can learn how to delete song duplicates from iPhone/iPad/iPod easily. Both methods require iPhone USB data/charging cable to connect your iPhone/iPad/iPod to PC. The 2 methods work with all kinds of iPhone/iPad/iPod modes, including the latest iPhone 6s/6s Plus. There are a couple of different reasons for creating so many duplicates in your iTunes, but generally it comes down to the operation reimporting songs that has already been added to the library. It is one common way of creating duplicates that you repeatedly import the same set of folders that are outside the iTunes Media folder with the option “Copy files to iTunes Media folder when adding to library”. Or your iTunes music library may mess up with many copies of songs after you sync with different iOS devices, like iPhone, iPad, or iPod. When it refers to mobile storage we don’t have too many alternatives to deal with the iPhone/iPad/iPod. Since the iPhone/iPad/iPod is designed without expansive storage capacity. Especially for iPhone, every megabyte plays a significant role in the iPhone. For the model of 16 GB, the lack of storage capacity brings about the a lot of problems, such as being chock-full of duplicate files, sluggish operation rate and so on. Not only ridding these duplicate items from the mobile library makes trouble for you, and there are also many disadvantages of removing it manually. Using iTunes’ "Show Duplicate Items" feature, you can locate and manually remove duplicate songs on your iTunes music library. Once the library is cleaned, you need only sync iTunes with your iPhone/iPad/iPod to remove duplicates from your iPhone/iPad/iPod as well. 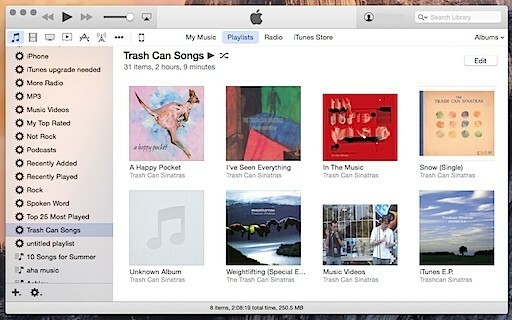 This guide takes iTunes 12 to remove song duplicates. Step 4: Connect your iPhone 6 to PC, click your iPhone from the device list, hit "Music" and select "Sync" to sync your library using your existing sync settings. In this way, you could delete duplicate songs on iPhone/iPad/iPod from your iTunes. But it will eat a lot time of you. To save your time, let’s come to the 2nd method – using 3rd-party iTunes cleaner program. Select a duplicate scanning mode to detect duplicate songs in your iTunes from Quick Scan and Deep Scan. Quick Scan mode is based on song tags including name, artist, album, file size and time, while the Deep Scan mode adopts Accoustic Fingerprint tech for deeper scanning. Choose desired one. Click "Scan iTunes" button to start scaning duplicate copies in your iTunes music library. Via scanning, all duplicate songs would be displayed. You could play back all reference duplicates and determine which file to keep and which file(s) to delete. After selecting which files to remove, click "Remove" button. Tunes Cleaner would immediately delete all duplicate songs. After you have removed all duplicate songs from your iTunes, sync your iTunes library to iPhone via USB. Connect your iPhone to PC and then sync the cleaned iTunes music lirary to your iPhone. Then, your iPhone music library would be refreshed and all duplicate songs would be deleted. At last, you only need to sync fixed iTunes music library to your iPhone/iPad/iPod touch via iTunes. In this way, you could remove duplicate songs for all iOS devices like iPhone 6s, iPhone 6s Plus, iPod touch 4, iPad Air, iPad Air 2, iPad mini, etc. Note: 1. Actually, if you get a lot of songs with incomplete songs info like artist, album art, album, etc., you could use Leawo Tunes Cleaner to add song info for your music files. Visit how to clean up iTunes for details. 2. If you’re using Mac computer to clean up iTunes music library on Mac, you need to download and install Leawo Tunes Cleaner for Mac.